We Have Spirit Yes We Do! We Have Spirit, How About You! October is National Bullying Prevention Month. 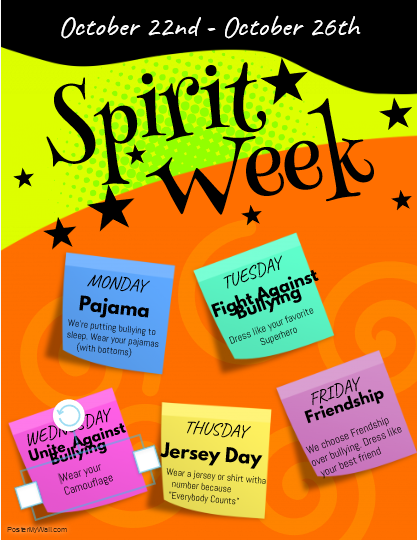 Kipp East will be celebrating in a fun filled spirit week! Beginning on Monday we will be putting bullying to sleep by wearing our pajamas. Tuesday we will dress like our favorite super hero to wipe out bullying. Wednesday we will unite against bullying by wearing our camouflage, and on Thursday we will wear our favorite shirt or jersey with a number on it because "Everyone Counts'. Thanks so much parents for all you do! And remember NO School on Friday, October 26th its Mandatory Report Card Conference.